Evelyn MP Bridget Vallence with concerned locals. 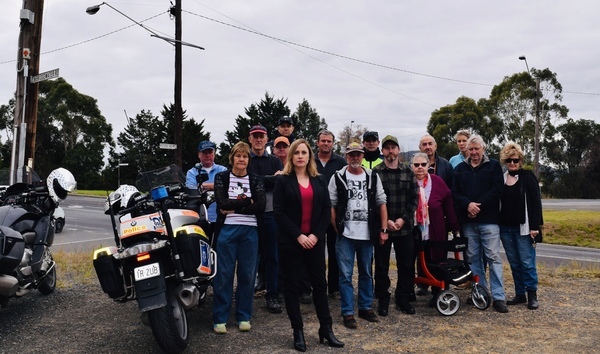 Evelyn MP Bridget Vallence is throwing her support behind residents’ calls for road safety upgrades in Seville East. She met with the concerned locals and traffic police at the corner of Peters Road and Warburton Highway on Wednesday 10 April. The meeting followed the death of a Woori Yallock man on the stretch on 4 April and several stories in the Mail in recent months about the Warburton Highway intersections with Peters, Sunnyside and Douthie roads. “Local residents and traffic police have shared with me their stories of frequent and serious accidents which highlight the dangers, and are calling for a common sense approach to install turning lanes and traffic islands to make this stretch of road safer,” Ms Vallence said. She said the police who attended the meeting also attended the fatal crash, and stressed how important it was to improve safety in the area. She listened to calls for dedicated turning lanes and traffic islands to be installed. As the Mail has reported, residents’ requests to VicRoads have so far fallen on deaf ears. “I will be calling on the Minister for Roads requesting urgent action to install dedicated turning lanes and traffic islands on Warburton Highway at Peters Road and Sunnyside Road,” Ms Vallence said. A VicRoads statement to the Mail said investigations into the need for improvements on Warburton Highway in Seville East were ongoing, and VicRoads would determine the need for intersection improvements as part of the fatality investigation.